Product information "Eurotronic Spirit - Heating panel thermostat"
The new Thermostat by EUROtronic has a completely new design. You can change the panels (available as an accesoire) and costumize the thermostat to your own individual set-up liking. Z-Wave Users get bunch of new functions. The device is equipped with FLiRS (Frequently Listening Receiver Slave) and reacts immediately to incoming commands of the Z-Wave controller. Furthermore the device is able to be connected to an external Z-Wave temperature sensor. Because of that the thermostat refers to the temperature of the external sensor, which can be placed in the middle of the room. 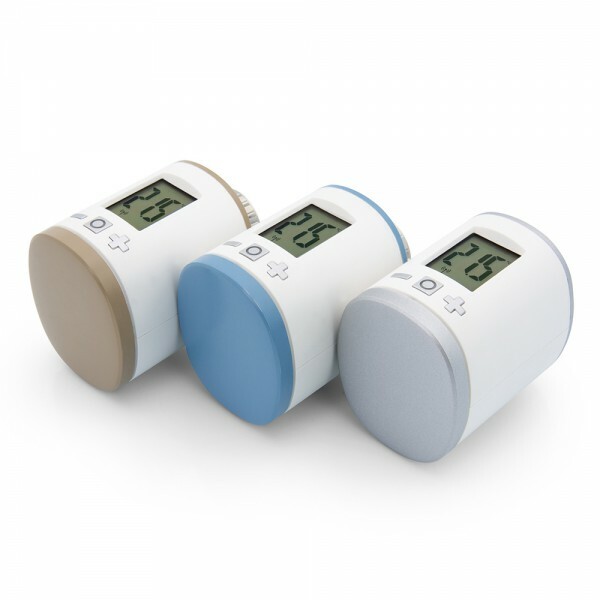 The display of the thermostat has a background light and has a big LCD screen. Besides you can also lock the local buttons as a child protection. The multicolor LED of the central button allows a intuitive usability because the User is invited to follow the instruction based on the blinking LED of the middle butto. Spirit Z-Wave Plus is delivered with silver design blends for the battery compartment and the Decoration ring. Additionally a white neutral battery compartment is enclosed. As accessory you can get different colors for the battery compartment and the decoration ring. The colors are costumizable to the living environment. The TRV can either be used as heating thermostat or as a actuator depending on the configuration of the device. The measured temperature or the position of the actuator of the thermostat are transfered to the Z-Wave gateway. Related links to "Eurotronic Spirit - Heating panel thermostat"